Using a training journal gives you much more than just a record of your workouts. It can help you clean up your nutrition habits, get mentally stronger, and even help you recover faster. Here’s how to go next-level with your log book. 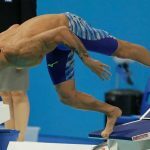 Like with anything else in the pool there are a few different approaches swimmers take when it comes to their training. You can be the swimmer who does the bare minimum or the swimmer who exceeds the standard. It’s no different with the way that swimmers log and track their workouts. For many, it’s an exercise in straight record keeping. Here are the sets, here are the intervals, and maybe a couple of the results. And then other swimmers will go much deeper. 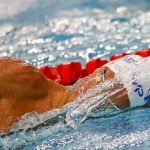 Caeleb Dressel, the fastest man ever across 50 and 100 yards, and an Olympic gold medalist to boot, used his log book as a way to improve his feel for the water, writing pages on how his body was moving through the water. Katie Ledecky used her training journal to write out her sleep and nutrition habits, as well as use it as a tool for gratitude. There are swimmers who do the basics, and then the ones who make the most of this powerful weapon. 1. Rank the way your self-talk is going in practice. 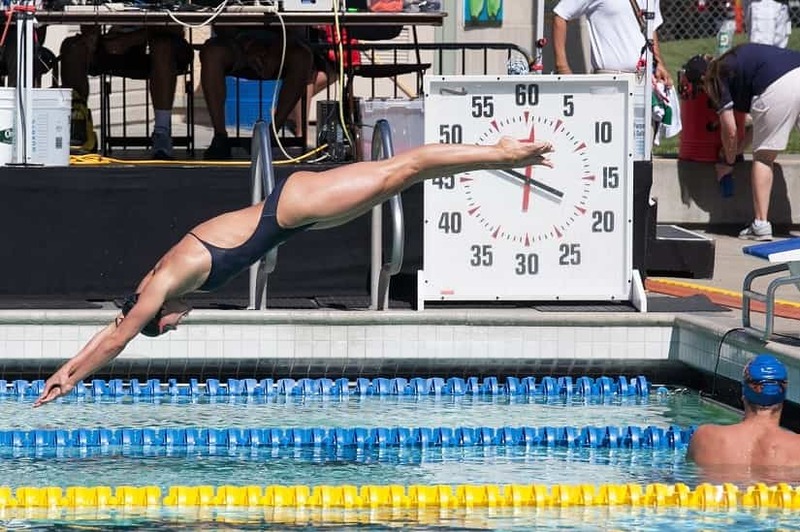 For most swimmers their mental training and mindset are an afterthought. 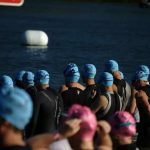 Something they might only think about when it comes to the moments right before their race and they realize that they are too anxious, not anxious enough, or start feeling the doubt and uncertainty that is commonplace right before a big race. 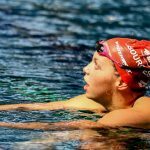 While mental training for swimmers is a broad and far-reaching matter, there is one thing above all else that can help you become a calmer, focused and faster swimmer. And that is working on your self-talk. After all, the things that we say to ourselves dictate our actions. If we tell ourselves to keep pushing and to not give up during a hard swim workout, our actions follow. Similarly, if we get down on ourselves, and use self-talk that is limiting and negative (“I stink, I’ll never be able to do this set”), the way we perform inevitably follows. The way we perform in the water is inextricably linked to our self-talk. And the first step in making sure that our self-talk game is tight is by being aware of it. After each practice write down a couple quick notes in your training journal as to how your self-talk was that day. 2. How much QT are you getting between the sheets? Physically and mentally there is no bigger thing you can do for your swimming then getting more sleep. 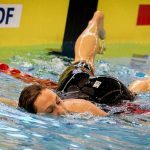 Beyond the fact that most of us tend to fall on the miserable side of the fence when it comes to being sleep deprived, cutting our sleep short repeatedly can have serious effects on our training in the pool. Our focus levels and attention levels plummet. The hard sets feel even harder. Pure sucky, in other words. Each day write down how many hours (roughly) of sleep you got, and set yourself some sleeping goals for the rest of the week. Setting a bed-time sounds like a pre-school way of getting your sleeping patterns in order, but something this simple, monitored and tracked in your log book can help you spend more quality time in the bed sheets. 3. How well you are doing in the kitchen. Eating properly, with well balanced meals means you are recovering faster after those brutal workouts. It helps you bounce back, particularly key with two-a-days. 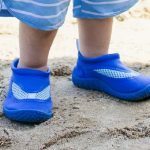 It keeps your immunological system functioning properly, keeping you from falling ill. And it will give you the energy necessary to stay awake and functional the rest of the day while you aren’t getting hammered at the pool. The problem I’ve always had with my nutrition is that my short term memory is hilariously short when it comes to meals. That one bad meal doesn’t seem so bad in hindsight, while I will take that great meal I ate earlier as justification to eat like a garbage truck later in the day. Writing out how well you are eating (you don’t even need to write out everything, but just the essentials) will help you to stay more honest with how well or not well you are truly eating. 4. Where your stress levels are at. We are living in a time of heightened anxiety and stress. The funny part is that it is entirely our own doing—we spend our days staring at glossed-up images on social media, making us feel inadequate and FOMO’ing hard. With meet results available instantly we can measure ourselves up against other athletes almost in real time. And with what is expected of us getting higher and higher—if you want to swim in college you are going to “need” a scholarship—it can leave young swimmers feeling far more anxious and stressed than necessary. Being aware of this stress, and actively doing things to combat it—keeping a daily gratitude list for instance—are key. Stress, besides making us miserable, is not healthy, compromising our ability to fight off sickness and illness. At the end of each day write out your stress levels, and perform some strategic journaling if necessary to help dampen the anxiety you are feeling. 5. How focused were you in training today? 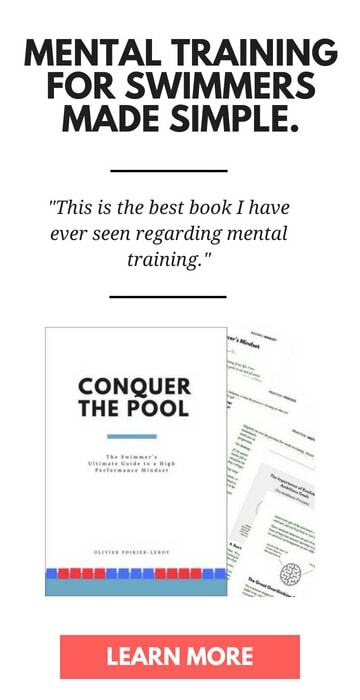 Have you tried to be completely dialed in mentally on a swim practice from beginning to end? I know that I haven’t…at least, not that I can remember. It’s hard! That kind of completely sustained concentration is—as far as I know—next to impossible. That doesn’t mean we can’t throw bouts of deep focus at our training, however. Especially when you consider that the types of focus we use from set to set varies. 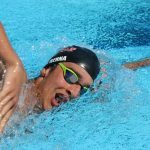 For instance, the kind of technical focus you would use during warm-up and drill work will be different from the kind of motivational focus you would use when in the throes of a mega hard set. How focused and deliberate you are being in practice matters big time. 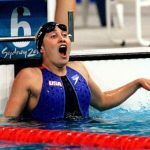 A swimmer who is focused on technique during the “garbage yardage” portions of a practice will slowly develop into a much more efficient swimmer than the other swimmer in the lane who pays zero attention to technical aspects of their swimming unless instructed. Similar to how we made a couple notes detailing our self-talk over the course of practice, make a couple notes discussing how focused you were in the water.